Born and raised in Milan, Italy, Chiara Capobianco’s earliest musical memory finds her at ages 3-5 attending the Puccini Festival in the charming hamlet of Torre del Lago in Tuscany, where the famed composer wrote classic operas like “Tosca” and “Madama Butterfly.” Her early passion for classical music, her natural wanderlust – and her later love, as a child of the 80s, for the pop magic of American icons like Michael Jackson and Madonna – laid the foundation for her emergence as a true musical citizen of the world. 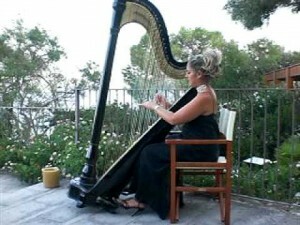 In the 20-plus years since she performed her first professional gigs as last minute fill-in harpist in orchestras everywhere from her home country to Switzerland, Poland and England, the multi-talented musician has performed for thousands of people across the globe – in settings ranging from cruise ships, hotels and weddings to clubs and concert halls. Since 1990, she has gigged as a solo harpist (with both classic and Irish harp), in duos with fellow harp players and also with violin, flute, cello, piano, voice and full ensembles.